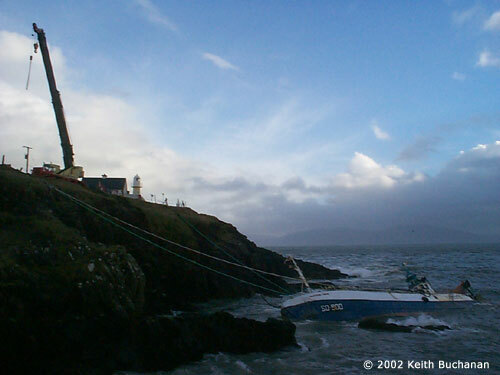 On Saturday 2nd February at 7.30pm the fishing boat Celestial Dawn ran aground at the mouth of Dingle Harbour. The 180-tonne vessel had 39,000 litres of oil on board. Once the immediate priority of getting the fishermen off the vessel was carried out, the potential pollution danger on the surrounding area, and on Fungie the Dingle Dolphin became apparent. We have tried to keep abreast of all events in this incident, alerting readers of irishdolphins.com of progress in the salvage and clean-up operations. In the weeks and months to come there will be a review of what happened, what might have been done differently and what we can learn from such an event. But in the meantime you can review the events through the links below. Click here to see the Dingle Oil Spill picture gallery.